With the pet containment system, your pet can roam – and you can relax, knowing he’s as safe as he is happy. Our in-ground fencing system is one of the most affordable ways to keep your dog safe and secure in his own backyard. RADIO DELUXE FENCE - Now he’ll stay instead of stray. This in-ground fencing system is one of the most affordable ways to keep your dog safe and secure in his own backyard. He’ll hear a warning tone as he nears the boundary you’ve established and a quick correction if he attempts to cross it. The lightweight adjustable collar is the perfect complement to the newfound freedom your dog will experience on his old turf. RADIO FENCE SUPER - Suitable for larger or more stubborn dogs. Stubborn dog, you've met your match. He may be stubborn, but that doesn’t mean he can’t be kept safe and secure. To help manage your strong-willed pal, this in-ground fence comes equipped with five adjustable levels of correction, including a tone-only plus vibration mode. The adjustable collar is especially designed for hard-to-train dogs of every size. Relax, help is on the way! IN-GROUND CAT FENCE - Suitable for cats or dogs > 2.7kg and older than 6 months. 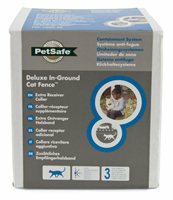 This deluxe in-ground fencing system was designed to let your cat be himself in the safety of your yard. It provides safe and reliable containment for your cat with tone-only plus 4 levels of correction that take her temperament into account. The collar has a special stretch section for your cat's safety, and a battery-life indicator to assure you that the collar is working. With this innovative, portable system, there are no wires to bury. Just plug the Transmitter into an electrical outlet close to the area where you want to contain your pet. Charge the rechargeable Receiver Collar in 2-3 hours. The Transmitter communicates with your dog’s Receiver Collar and helps keep him in the designated area by first delivering a warning tone should he approach the containment perimeter, and then by delivering a harmless but surprising electrical stimulation should he proceed further towards the containment edge. The system is portable, so you can bring it along with you! An unlimited number of pets can be added to the system as long as they wear a PetSafe® Wireless Receiver Collar. This extra receiver collar can be used to add another dog or as a replacement collar to In-Ground Radio Fence Systems. The Ultralight Receiver comes complete with collar, batteries and short probes for short-hair dogs and long probes for long-hair dogs. • 1 Level of correction. • Suitable for dogs > 3.6kg and older than 6 months. • Weight 45gr and Waterproof. • Progressive Correction and Anti-Linger programming. • 4 adjustable levels of correction plus Beep-only mode with vibration. This extra receiver collar can be used to add another dog to any PetSafe in-ground fence system or as a replacement collar to the Stubborn Dog In-Ground Radio Fence. For larger or more stubborn dogs. • 4 adjustable levels of correction plus Beep-only mode. For expanding in-ground pet fence systems. Add additional wire and flags to increase your fence area. This kit will compliment the wire and flags that come with your in-ground pet fencing system. Includes: 150m wire, 50 boundary flags and 2 wire connectors. This extra Reciever Collar can be used to add another dog or as a replacement collar to the Stay + Play Wireless Fence™ Wireless Containment System.